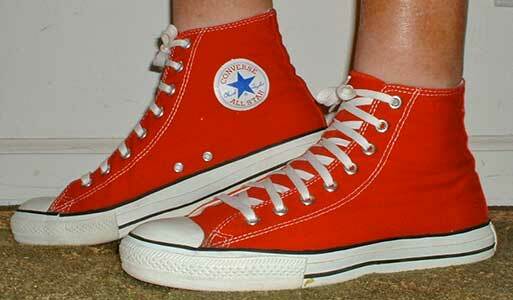 Red high top chucks are cool shoes that make a statement. Since he first endorsed the Converse shoes in 1923, Columbus native Chuck Taylor’s All Stars have evolved from footwear worn mostly by basketball players to a pop-culture classic adored by men, women and children for comfort, casual style and cultural chic. And for more than 30 years, every pair of Jon Monies’ red high-top “chucks” has gone through quite an evolutionary process, too. Monies, a surveyor and engineer from Columbus, recalled Chucks past and present after hearing Converse Inc. has declared Chapter 11 bankruptcy and will move production of All Stars to Indonesia in April. Now in his 50s, the 1965 Seymour High School graduate purchases two or three pairs yearly, getting his money’s worth from dozens of pairs of the canvas classics every step of the way. Except in cold or rainy weather, he wears chucks almost every day. “When they’re new, I wear them for dress and as golf shoes,” said Monies, who started wearing chucks as a Purdue student. Red high-tops fan Monies made at least one exception to his all-red passion — he once paid $4.95 for a pair of white chucks. They, too, saw a lot of action. As other athletic shoes have outpaced chucks and other Converse styles — a factor leading to the company’s bankruptcy — chucks have become harder to find. Some chucks addicts purchase different styles of All Stars from online shoe companies. Converse company spokesman Mark Shuster said recently that the shoes will still be available at retail and online outlets. Monies, who used to find his red All Stars in department stores, now shops for them through the J.C. Penney catalog, paying about $34 for his Size 10 sneakers. The Columbus man figures he’ll wear the durable, rubber-soled shoes as long as they’re made. “They’re lightweight shoes that breathe well,” he said. “And because they’re canvas, they dry quickly. When you go canoeing, you can sit in the canoe, drain the water out of them and hang your feet over the edge of the canoe until they’re dry. Former Columbus High School basketball coach Bill Stearman wore chucks as a player at Columbus High School in the early 1940s. “They were $7 then,” he said. As a coach at Waldron in 1949, and then at Columbus High School, Stearman purchased them for his teams. Several years ago, Stearman met Taylor’s wife, Lucy, who donated a plaque Taylor received for his induction to the National Basketball Hall of Fame to Columbus High School. The plaque honoring the 1919 Columbus High School graduate is on display in the lobby of Columbus North High School. “The All Star was the best basketball shoe that was made for a long, long time,” he said. Then, in the early 1960s, stars like Oscar Robertson of the Cincinnati Royals came along, endorsing leather athletic shoes like those made by Adidas. The shoe Taylor had endorsed so long ago, said Stearman, paled in comparison. On the Internet newsgroup called alt.fashion, there was a discussion about chucks being a guy magnet for girls who wear them. Christina Cazanas, who lives and works in Manhattan, wore blue chucks in high school. She responded to a call for chucks fans posted online for The Republic by Mike Pegram of Columbus, creator of IU-centered Web site peegs.com.